I visited Edinburgh recently to watch Rachmaninoff’s Piano Concerto No. 2, one of my all time favourites. I always watch it live whenever the opportunity comes around and fortunately I had time this year. I love Rachmaninoff’s music, having learned one of his preludes – Prelude in G# Minor, Op. 32 No. 12 – as part of my Diploma programme, I immediately fell in love with it and listened to his other works and researched about Rachmaninoff and his work. I came across his famous Piano Concerto No. 2 on YouTube (https://youtu.be/rEGOihjqO9w) performed by Anna Federova and the Nordwestdeutsche Philharmonie – conducted by Martin Panteleev – in the Concertgebouw, Amsterdam. That performance was heavenly and moving that I kept going back to it whenever I had a rough day or week. The first time I watched the Rachmaninoff Piano Concerto No. 2 was in 2016 at the Glasgow City Halls, performed by Steven Osborne and the BBC Scottish Symphony Orchestra. The live experience was much greater, I remembered the bell-like opening chords, it was haunting. It overwhelmed me and moved me to tears and it also gave me a sense of reassurance. This time, I went to the Usher Hall to watch it performed by Freddy Kempf and the St. Petersburg Philharmonic Orchestra. It is truly amazing to hear different interpretations of the same piece, played with the performer’s own touch and flare. This was my third time watching it performed live and I am still amazed by the Music. Freddy played it with power, passion and spirit in the Music which is different from the sensitive performances I have heard previously. The Russian Philharmonic Orchestra was absolutely brilliant, they really embodied the true Russian influence in their playing – it lures you into a spell. The Piano Concerto No. 2 in C Minor, Op. 18 was composed from 1900-1901, it was one of his well-known pieces and it established his fame as a concerto composer. The second and third movements were first performed in 1900 and the complete concerto was premiered in 1901 performed by Rachmaninoff himself and conducted by his cousin, Alexander Siloti. Rachmaninoff fell into depression after a disastrous premiere of his first symphony and due to struggles in his personal life; it lasted for three years. This was his recovery composition from depression and a creative block, he underwent hypnotherapy and psychotherapy, with the support of his family and close circle to help him get better. This concerto was dedicated to his therapist, Nikolai Dahl who helped him gain back his self-esteem. Do you ever feel bored of your routine? Does it get repetitive and meaningless? Yep, I feel the same way too. Even if it’s doing something I love, it turns into a chore eventually. It makes me question why I’m doing it in the first place. Practicing Piano for me is like a love-hate relationship, especially being at this standard, it takes longer to progress and pieces get harder to learn, it feels like I am going up a really steep hill. I’ve been learning the pieces I have now for a few years now and I am losing a little patience to complete learning my Diploma programme and to get it up to performance standard. It is a challenge to have self-motivation as my days of Piano only consist of practicing and weekly lessons. Only seeing my teachers and students. I am not yet in university so I do not have lectures nor classes. Don’t get me wrong, it is very fulfilling to finally learn a piece and play it the way I wanted it to sound like – those moments make me feel euphoric and I could sit and practice all day. It fuels my fire in learning and burn my passion in Music. All I have to do is to change things up, let’s take things back a little, how did I keep my fire back then? What made me want to practice all day and get immersed in the Music? The answer is simple. It’s to love and feel the Music, it is about the sound and not the black dots on the page – it is to simply pour out everything you have to express yourself. Not to overthink things and just enjoy the moment. Music is like a vessel that flows through you. No matter what it is you are doing, may it be a project, assignment, dissertation. Just remind yourselves why you started in the first place and always keep your goal in mind. The journey may be tedious and long but just learn to simply enjoy it. Think why? Why did you choose this topic for your dissertation or project? Why did I take this job? Find the joy within the process and you will find your answers. Do let me know what you find. All the best. You may feel overwhelmed and doubtful, questioning yourself if what you’re doing is really worth it. As for many, the easiest way to get out of the struggle is to give up but that’s when you start pushing harder and keep your passion alive. Throughout the years, I have faced many roadblocks and unsuccessful auditions. I even thought about giving up my passion to pursue Music as a career and started thinking of doing something else in a completely different field. It may feel like the end of everything, but I learned to look at the situation in a different perspective – this isn’t the only path to getting to where you want to be, this is only a detour. I still had so much to improve on. Let’s use a game for example, you have encountered a gate which allows you to move forward but you’re still missing that certain item that requires for you to unlock it. In my case, I still have to get more performance experience and qualifications in order for me to enter that gate to be more prepared to face whatever is ahead. Who knows you may even meet people along the way who will help you get to where you want to be. You may have already have a plan but let’s be honest here, plans never go exactly the way you want it to. There’s always an unexpected roadblock and detour. Nothing in life is every really planned out. The lesson is to never give up and find your way at a different angle. Do not panic when you hit that roadblock, instead look at your situation, sit still and reflect on what you still need to improve on or get. If you believe in your dream and vision, you will do whatever it takes to reach it, no matter what others say or think. Have some faith! It’s nearly the end of January and I’ve pretty much planned my year ahead. I have taken some time out of social media just to focus on upcoming recitals, auditions and exams – so far so good, I only ever go on it on the weekends to check important messages. My headspace is much clearer compared to how scattered my thinking was last year. I now have a clear idea of how to reach my goals, with the help of my mentors, teachers; support from family, friends, colleagues and community; and guidance from Him. I am certain I will do well! With workshops and performance trips ahead, I will improve on my performance endurance and musicality when practicing and performing and stay inspired by watching professional musicians in live concerts. I have a few concerts coming up to watch and I am really looking forward to seeing Nicola Benedetti, Sheku Kanneh-Mason and Valentina Lisitsa and my all-time favourite Rachmaninoff’s Second Piano Concerto at the Usher Hall in Edinburgh. It gets lonely sometimes when you’re doing your own thing and treading your own path but at the same time it’s great knowing that you’re progressing! Also, seeing and hearing others pursuing their dreams and treading their own paths are inspiring, no matter what field it is. Even though it’s easy to get stuck in a routine of work, lessons and teaching and get burned out. We just need to remember to take a break from time to time and be still. All of the hard work will pay off and it is for the best. Here’s to 2019, a year of growth and financial breakthrough. I have finally fulfilled one of my long term wishes to start a WordPress website and hopefully be consistent with blogging. Just a little bit about myself, I’m Patricia and I am currently on the journey towards getting into Music School. 2019 is the big year that I finally get into university! I am a first study Pianist and was classically trained from the age of 11 – so it has been a decade since I started playing. My journey in Music started in first year high school and I immediately found my passion and sense of belonging in it. Shortly after taking up Piano, I also took up the Flute throughout my secondary school years but stopped playing ever since I left school. Being a part of Music ensembles makes me feel at home, playing Piano in the Jazz band and Flute in the Concert Band – the people around me are full of enthusiasm and joy when it comes to playing Music. That kind of environment kept me going and made me want to pursue Music. I taught myself some Fingerstyle and Classical guitar – although I am no master at it. I done it purely out of enjoyment, one of my inspirations in Fingerstyle guitar is Sungha Jung and I have been following him even before I started playing Guitar. I have always wanted to play Guitar like him so I learned one of his arrangements ‘So Sick’ by NeYo and uploaded it onto YouTube and surprisingly got 11k views for it! Ever since I left school, all I have been focussing on is Piano, after all it is my first study. For the past few years taking some time out, I have performed at recitals, hotel gigs playing solo and accompanied others, accompanied a String Orchestra at Christmas concerts and so on. Being able to perform is an honour and I enjoy every second of it, it gives me the opportunity to express myself and pour my heart out into every single performance. The journey to Music School isn’t always sunshines and rainbows. I have faced some tough challenges and sometimes… it gets frustrating when you feel like you have no direction. Performance opportunities do not show up often and it has been a while since I last performed solo, sometimes I get bad performance anxiety. 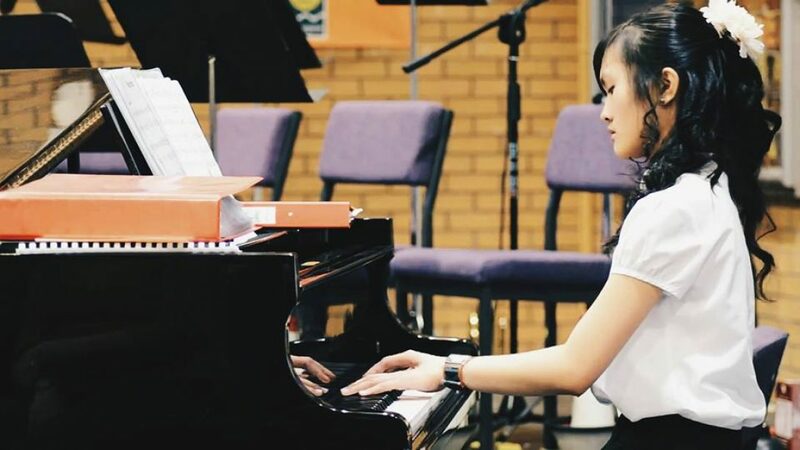 I remembered one time when I had to perform in the Royal Conservatoire of Scotland’s Piano Summer School and once I sat down in front of the Piano, it feels like I have been disconnected from the Piano and playing feels odd and different. It was a tough and intensive summer school but it was worth every second of it, being taught by some of the top professors in the world. I am also part of the Transitions programme within the Royal Conservatoire of Scotland where I get Piano and Voice lessons as well as mentoring guidance. I have been blessed with this opportunity after having an unsuccessful audition a few years back. It knocked my confidence and when Transitions reached out to me, it felt like a new hope. It is the best thing I have ever been part of since I left school, it felt like I was stranded in the dark but I found myself once I joined. I took part in collaborative projects and made new friends who are likeminded, having dreams of getting into a Performing Arts school – some are from different art forms such as Acting, Musical Theatre and Film. Transitions also offer performance trips and short courses that are all paid for and some allowance to help students to get by during the year. Now, I have sent in my university applications for Music and have auditions pending. This is exciting! I have also started teaching Piano to primary school students and fingers crossed, I get more students in the near future. Currently, I am preparing for two Piano Diploma exams in March and July – it feels like ages away but it isn’t! I am still a work in progress but I look forward to what 2019 has for me in store! Thank you for reading til the end! I’ll be sure to keep you posted. The 1975 is my favourite band and them being my first concert of the year is a great start. They’re the only band I have ever followed and it’s my second time seeing them, their show this year was amazing! It definitely topped their concert 2 years ago. Their aesthetic is so pleasing. Managed to keep it a secret from my sisters that I bought them tickets for Christmas. The 1975 was a sold out show and I was fortunate enough to grab tickets at such a decent price at the pre-sale when it came out. Yes, I woke up early just to be in line for the tickets online. No Rome – a rising star. I am so proud, a new and upcoming Filipino artist touring worldwide with the 1975, he is way better live than in audio. I immediately fell in love with his voice. 12 January 2019 is one of the best nights of this year so far, cannot wait to see what 2019 has in store for us all.